Public trust in media and government has gone down dramatically around the world, and business isn’t doing too well either. But 79% of people always trust the doctors and nurses treating them through the NHS. 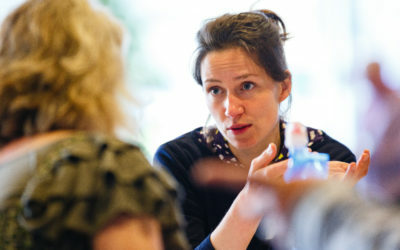 So how can we build on that trust to get patients to engage with community businesses and improve their mental health? Many people have a good experience with local charities and community businesses but some don’t – often this is because the service is overstretched, trying to do too much or relies on (sometimes) untrained staff and volunteers. I work for New Wortley Community Centre, in a part of Leeds with a community that has serious health and wellbeing needs. Open a total of 151 hours a week, our two centres give local people, 29% of whom claim out of work benefits, a place to meet, learn new skills to get back into employment, improve fitness and wellbeing through GP access, mental health provision and physical activities, as well as improve social cohesion through volunteering. We’re doing well but realised people who were being referred from local GPs to us weren’t always coming through our doors. So we’ve started a pilot with Thornton Medical Practice, for a direct service based at a GP surgery nearby where the GP can book a patient an appointment with a clinically trained counsellor on site. Currently we have eight, 30 minute long appointments available a week. The counsellor then assesses the patient’s needs and follow up appointments can take various forms – a home visit, one to one counselling, group counselling, an introduction to a support worker and an activity such as the walking club or volunteering at New Wortley community centre. These longer appointments give more chance to discuss problems in a safe space and for people to not only be listened to, but given something they can actively do to address their need. By having the initial appointment at the GP surgery, the trust is maintained and there is control in the process. If the GP has trust in the service then the patient will as well. Trust is transferable. This has to be followed through and if clinical outcomes are to be measured, then it must be in a rigorous fashion. The days of just handing over a leaflet and saying get along to this or that, especially to a patient who may be low on confidence, has had bad experiences, or has a mental health problem are numbered. It leaves too much to chance. If we really want to make progress with these issues and reduce demand on GPs, then some upfront investment in services such as these could really change the system from fixing a problem with short-term prescriptions to helping people make a long-term lifestyle change that benefits their health. Bill Graham is a studying fellow at Leeds Institute of Quality Healthcare, a Community Leader of New Wortley Community Association and a Community Business panel member at Power to Change.